I told you this race was going to heat up. I had given you a hint on this, and I've been sitting on it until the dust cleared and the races were on, but it's now confirmed. After working on the initial stages of Rapid City Councilman Sam Kooiker's fledgling Mayoral race, Councilman Mike Schumacher has been paid to change horses in mid stride over to Mayor Mike Shaw's campaign. Schumacher was approached by Rapid City businessman and Shaw supporter Doug Hamilton to help run Shaw’s mayoral campaign. Schumacher said he was talking about helping Councilman Sam Kooiker get into the mayor’s chair, but a better offer came along. How much Schumacher will be paid has yet to be determined, as the contract is not yet complete, he said. I guess I'll be doing some blogging this weekend after all. I'm stuck in Pierre. It's been a "maybe I'm going/maybe I'm not" day, and when it came down to brass tacks, the plane can't land in Brookings, due to ice and crosswinds. And the next flight is about 3:30-4 pm tomorrow. This is a big disappointment. Not just a "oh, gosh" thing, but a "#$%%^&*((*&^%$$#@" thing. As much as I enjoy politics, I'd much rather see the wife and kids. And I actually think they wouldn't mind seeing me. They've been stuck inside for half the week due to the weather, and I'd love to give my wife a break. She works hard enough, and doesn't need a weekend where she can't tag off to me. But it's not going to happen today. So, we soldier on. Just a little weather today as I sit and wait to see if I'm flying over to Brookings tonight, or if I'm stuck in Pierre for the weekend. Although, I did catch that during a down moment as a recess was ending, Senator Bartling was reading some of the comments on my website. I complimented her later for her taste in reading. As noted, the Senate is back tomorrow AM. Whether or not I'll be is contingent upon the weather. As I figure out if I've been snowed in or not (I'm flying tonight), I would pass on that the legislature has agreed to meet tomorrow. At least the Senate is convening at 9 am. If you are a home schooler, and there’s a blizzard, do you get a snow day? And, if you do, where do you go? The school? I was trying to figure out something to write this this cold and wintery morning. As I was reminded recently by someone who didn't like what I had to say, despite my political affiliation, I'm sometimes accused of being too tough on my fellow Republicans. (As if they haven't been giving me a reason to grumble with some of the legislation this year). People who know me understand that more than anything, I go after stupidity. But yes, let me assure everyone, I remain steadfast to my political affiliation, and take ample opportunity to remind everyone that we live in a conservative red state. To point out why Republicans are always the better option in South Dakota, let's take a look at the batting averages of some of our new Democratic all stars. Tom Katus was one of the more expensive players for the Senate Dems this year, but with Benedict Arnold Republican Stan Adelstein backing him, price was no object. Too bad Tom isn't producing very well this year. Democratic State Representative Jim Bradford has been a bit of a cut up this session, and I have the sound clips to prove it. I'm trying to get the best one to convert, but converting the 3 hour block of audio I have to convert to get to it is giving me fits. Until I get that one, here's a pretty good one on Senate Bill 70 regarding massage therapy. 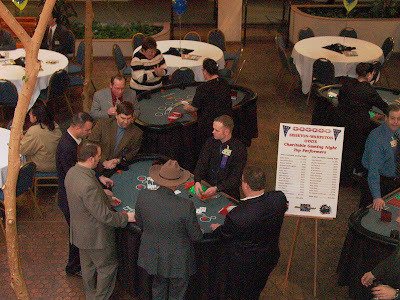 Barry Wilfhart of the Dakota Sioux Casino was nice enough to provide a recap of the charitable gaming night held last Thursday night at the Ramkota Inn which raised money for the favorite charity of each legislator. This was the third year for this event, one that has rapidly become one of the legislator's favorites. We're #2 - and that's a good thing. Thune v. Rounds.Which side are you on? Federal Railroad Administration says: No.